The Women’s International Music Network, an organization formed by Mad Sun’s Laura B Whitmore that unites women who work within all facets of the music and audio industries, recently hosted the second annual Women’s Music Summit. 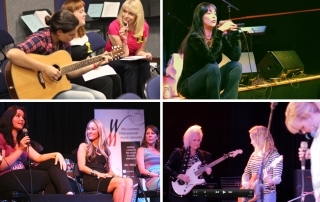 Taking place over July 26 – 28th, 2013 at Musicians Institute in Hollywood, CA, women of all ages and instruments gathered with artist instructors and industry experts for instruction, songwriting collaboration, industry expertise and more. Highlights from WMS 2013 included performances and workshops with guest artists such as Michael Jackson guitar legend Jennifer Batten, Grammy Award winner and Songwriters Hall of Fame inductee Holly Knight, award-winning pianist and TV/film composer Starr Parodi, all-star Chilean drummer Val Sepulveda and renowned vocal coach/Los Angeles Women in Music President Leanne Summers. Through master classes and informative Q&A sessions, these artists shared their techniques, knowledge and experiences with Summit participants. “It was a blessing to be a part of the gathering of like-minded creative souls at the Women’s Music Summit. I could feel the love of open hearts connecting and sharing,” says guest artist Jennifer Batten. Many attendees had the opportunity to participate in intimate jam sessions with Batten and the other artists as well. “There are a lot of music conferences out there, but the Women’s Music Summit is the only one where I’ve had the opportunity to collaborate creatively with phenomenal musicians from around the world” says WMS attendee/songwriter Allison Tartalia. “The Summit inspires me and nourishes my creative soul.” This was Tartalia’s second year attending the event.